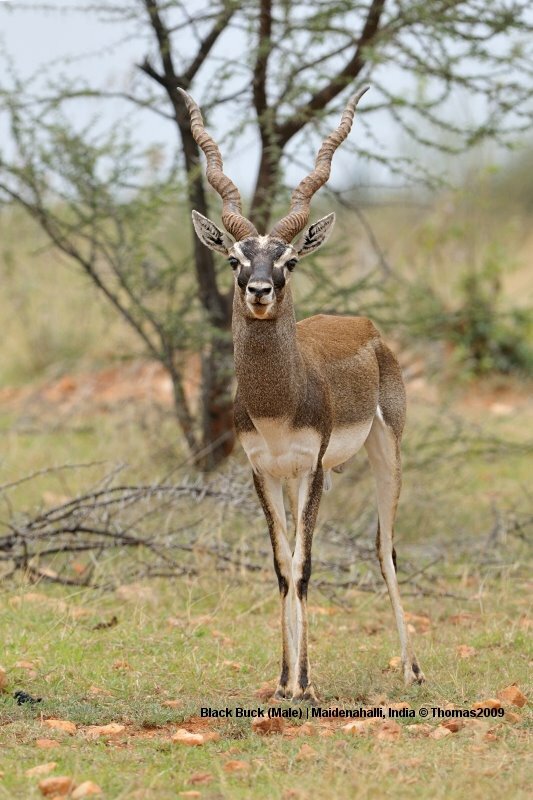 The Blackbuck is considered to be the most beautiful of all antelopes because of the male’s striking black and white pelage and long spiral horns. This species once roamed in huge herds throughout the open woodlands and cultivated tracts of India; today its conservation status is rated as vulnerable thanks to its large scale hunting. We went to the Maidenahalli Blackbuck Reserve in Karnataka, India, about 140 kms from Bangalore to get our first glimpse of this beautiful antelope. 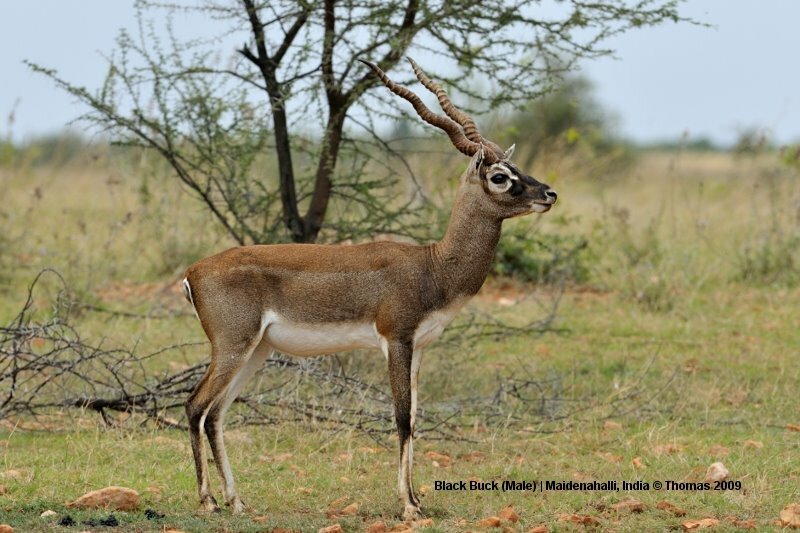 We can tell you from our experience that Blackbucks are very shy and its challenging to photograph them. Open habitats being their preferred choice makes it even more difficult to approach them. Phenomenal concepcion. You presented these animals in the exquisite way, you obtained their character, possibilities, you captured in fantastic scenery. I am under the huge impression of Your sensibility and skill, Thomas! All pictures are good. 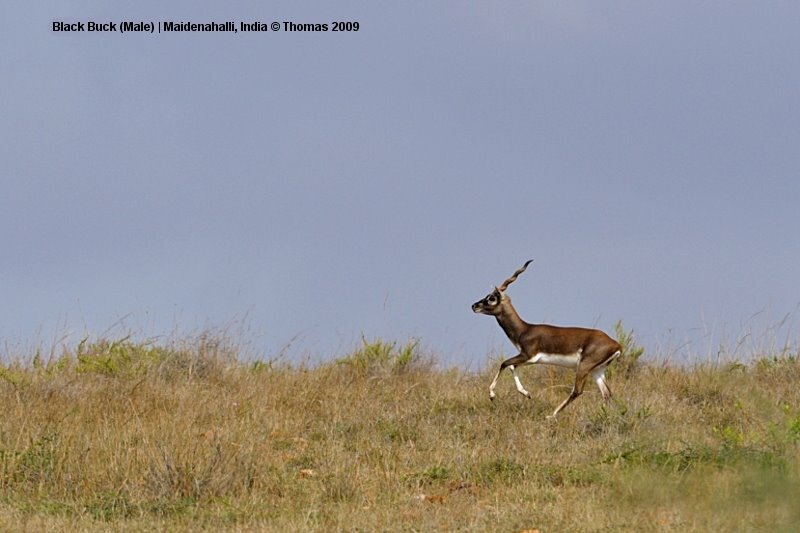 The picture in which the blackbuck leaps is my favourite one. The last two are really perfect. This is the first time I am seeing a blackbuck and completely agree with you. It is a BEAUTIFUL animal. Great shots. I envy you guys!! Wonderfull series again … extreme deatil and superb colors .. Congrats! Absolutely fantastic love them all … the second one is beautifully lit, and the last one amazing ! what patience and what eye ! Forgot to mention that I voted for your photoblog. Hope you guys make it to the top. You are the best among what I see out there. I forgot to mention when I was here this morning that I have brought back my hawks blog. Blogger saved the name for me. I have started posted in it again and have a lot of pictures yet to post. 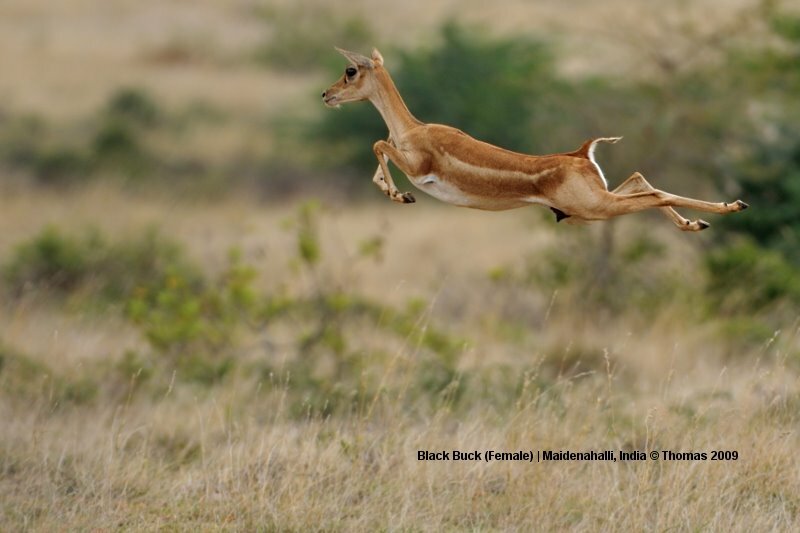 …and what a leap it was..just loved that pic of the female blackbuck! Wow..600 mm!!! Gorgeous. Loved your post..very nice photos! I like them all but that bottom shot is pure elegance. Sheer poetry, each one. I love the ones that capture them in motion – such elegance. WOW!! The pics are absolutely perfect, especially the last one with the gorgeous leap. For once again i am excited! Amazing shot, that last one. Dont know how you manage it time after time. Excellent actions shot my friend. Great shots, especially that last one in the air! Beautiful series, the last one is national geographic material! Wow your blog is full of great ‘long’ pictures. I assuming you are using a 2X TC on the 300mm. It looks like that is a beautiful lens. beautiful series i love the one with the female black buck jumping through the air, beautiful! What a beautiful, enchanting creature. Your shots are stunning, but that last one of the female leaping through the air is truly magnificent! Thanks for suffering through the heat to capture these images. Very stoic looking animal. Awesome series as expected. The bottom action shot is great! Blue Skies. WOW, truly great wildlife in action shot! Thomas: I must say you made some really neat captures of the Blackbuck. What a great looking antelope. excellent captures of this animal! thanks for visiting my site, i’ll be sure to check back here often as well. Your wildlife images are very appealing, keep up the excellent work! That indeed is incredible photography! You get double thumbs up for this post! Amazing!! Wow. These are really beautiful. Great captures! It must be wonderful to see something like this running wild. The second one and the last one are fantastic. Yes, I agree with Yvon who beat me to it! Wow Thomas for such shy creatures you did manage to get some great shots! I love the first one as it looks like a unicorn, especially the horn. I can totally see why they are considered the most beautiful. Your struggle with the heat paid off and the series is much more than “some decent photographs”. The last one is absolutely awesome, fantastic how you “freezed the moment”. The last one is my favorite! Wow! Such grace. Good job taking this photo. amazing! the story, the photographs, all of it, i’m completely in awe… what a truly remarkable animal, i’ve never seen one like that… thank you!! I have spent sometime looking through your images and they are stunning, absolutely stunning! I know how hard it is to get images like this so, respect! It is beautiful Thonas and reminds me of our Impalas, especially the female. I love the spiral horns. Once again, Thomas, you are one very lucky man! Unbelievable. I was watching Planet Earth with my grandson this afternoon and this fits right in! I love your last antelope shot where it is flying through the air. They kinda look tired with sad eyes. But beautiful at the same time. You showed every beautiful side and behavior of this antelope – you are the master of photography!! Wonderful – we have spent time to admire these, and especially the last one, that is pure power, elegance, grace and you have captured it all! you have captured beautifully the one in which the Blackbuck is leaping as i don’t think its an easy job to capture it like that. cheers to you Thomas! Cool photos especially the last one, great capture! What a beautiful and elegant animal ! Awesome pictures. Love the one of the female sailing through the air! Vaya coleccion de fotografias, buenas capturas. They look so carefree but I’ll bet they are worried about being dinner. Superb shot series. beautiful all! Truly sublime follow the walk of this small antelope! so much joy in these images, so much beauty, freedom! I’d like to follow! The last one is a dream shot. Well done indeed! What a wonderful art you guys are having!!! The level of perfection you have is very rare to find in this random world. Keep the great task up. Thanks for your recent comment. Coming up with titles and captions is not a strength of mine; my sister is better at that than I am. I’ll start adding more descriptive titles to my posts, though, and see how it works out. A fantastic series of this beautiful animal. It’s amazing that you were able to get such close ups. The female leaping is so impressive as an action shot. Excellent photography. Not only were you lucky enough to see this beautiful creature; you got some fantastic photos also. Absolutely fantastic! You’re very lucky to have access to such amazing places. A wonderful set of shots. While the least impressive phsysically, the most impressive shot is the leaping female. Wonderful timing to get that shot and to frame it so well. The first picture looks like a Unicorn. I love the last one jumping in the air. They are all fantastic. Well, the last pic is the best of the lot. Not that the others are no good…I just like it more! What shall I say, Thomas? Excellent images de cette antilope dans toute son élégance naturelle! Your photos are spectacular ~ amazing action shots! Great use of DOF. These are just phenomenal! I love the last one especially! Looks like she’s flying! Encore de somptueuses images. Mention spéciale pour le dernière ! Wonderful photography of these beautiful animuls! Great captures and clarity! That leaping buck at the end was an awesome action shot! All of them are great. Each photo is better than the previous one, and then you see the last image and just blown away..
My friend, thanks for your visit. Great wildlife pictures, and this last one is incredible! One day I will be able (€) to discover wild lands. Really nice set of photos. I especially like the last one. It almost looks like he is flying like Superman he is so high in the air! Brilliant snaps. I am pretty sure it was hard work trying to photograph these high-strung creatures. The last snap has to be the pick of the lot! I absolutley adore the last one. Thanks for showing us your side of the world. Amazing shots and the last one is stunning. Well captured series, Thomas. Absolutely stunning pics Thomas, the eagle ones were excellent too. Just a spectacular series of photos. The horns on the male are just unbelievable considering his head size. The leaping female is astounding! Oh my gosh, Tom! What beautiful creatures, and of course, stunning photographs. Fabulous air shots!! Wow…Looks like my grandson as he was jumping from rock to rock today…caught him in mid air..ha. This is just an awesome animal, Thomas! You captures some phenomenal images! That action shot – wow – looks like he is levitating!!! But that close up full body shot is amazing and my absolute favorite! Decent??? These are truly AMAZING SHOTS!!! It is a joy to look at this beautiful animal, captured so beautifully in its elements! Thank you! Unbelievably awesome captures, as usual Thomas! Truly gorgeous animals like these deserve having a photographer like you preserving their images. Very well done! Stunning!! You are just full of talent, Thomas! Such a handsome creature…the last two captures are my favorites. The mid-leap capture is awesome! Thanks a lot, so beautiful dear Thomas. Fantastic animal shots. Excellent quality and sharpness. Absolutely stunning final image, Thomas! Fantastic stuff!! Outstanding – especially the last one, the Black Buck! You never cease to amaze me! I love the jumping doe! Incredible series and that last image is jaw dropping. I was looking at some pictures yesterday of tigers from Kanha, Kaziranga & Bandhavgarh. My Dad always had me watch every wildlife program available as a child, but it surely isn't the same as SEEING & photographing the wild animals. That must be a wonderful thrill. A splendid series! Many beautiful pictures on your blog, congrats! A new great series of these beautiful animals. Do you know the splendid bird sanctuary of Bharatpur in the Rajasthan? Thats a fantastic place for all the lovers of the nature and especially for photographers. Beautiful series and lovely capture of grace. maravillosas capturas, todas perfectas y de una nitidez increible!! These were the first photos of blackbucks I’ve seen. Exceptional shots, Thomas. Beautiful series and capture of the Antelope. I especially enjoy the “portrait”. I’m always amazed about the wildlife featured here on your blog. The photographs of the Blackbuck is sheer poetry. Very beautiful. And you got a frontal view too! The eagle too is stunning. Imagine looking at the real thing at eye level!! One look from those yellow eyes and I would have fallen off the tree trunk. Both you and S really live a life I envy – getting away from the rat race every now and then and photographing beautiful creatures. Thanks for visiting The Plum Tree. Thank´s your visit in my blog. Sensational! An authentic story of fauna. waw, again such great shots. My favourites are the second and the last one of the series. GORGEOUS PHOTOS! Wow outstanding pose, background DOF… You are professional photographer. My favorite is the jumping female. Bravo. I’m finally back from Paris and again discover one of your magnificent post… You are really mastering your camera and lens as well as your environment, for our biggest pleasure!!! The last picture is just amazing!! well done blog and galleries! Truly amazing captures of these fascinating animals. You are the master at wildlife photography. Excellent images as usual. 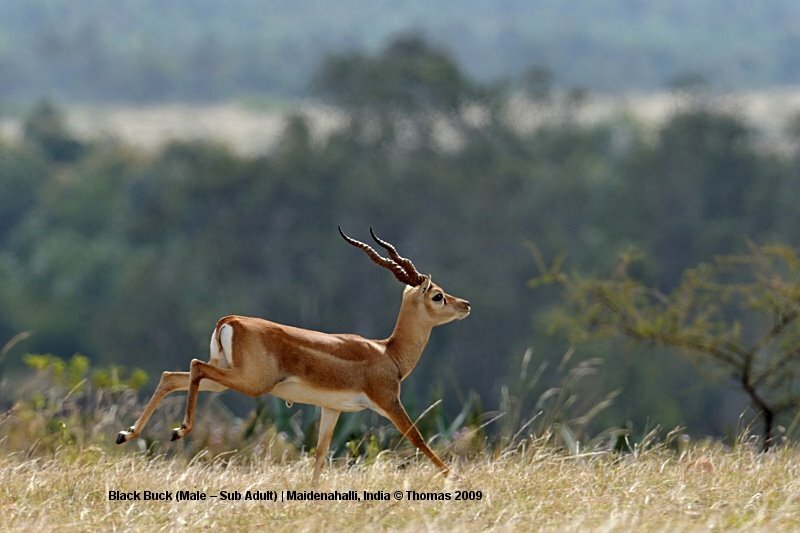 Fantastic photographs of the blackbucks, Thomas. Really, really nice! The leaping animal – frozen in midair – is a true master stroke! Superb photography, every one a gem! What wonderful fancy horns the buck has, no wonder there are few left. Very nice! The leaping female is quite spectacular! Breathtaking. Awesome. Words defy what I think of your pictures. I am honored that you came by my blog. Beautiful photographs, it must be so exciting to be in India and experience these creatures in person in the wild. That last shot is incredible. These animals are so graceful and powerful. I’m sure these shots took hours to get. Nice work, thanks for posting these. Thanks for sharing these wonderful adventures and photographs- I’ve got to visit India someday! You did a good sequence antelope! Which is in full jump is very good! I want to thank you for the comment on my image, you are the only people to get the concept. Your photos of wildlife are superb and you commentary with the images is perfect. I will be adding you to my blog roll. Great series indeed, I didn´t know this antelope, now I know it. Your patience paid off! Beautiful creatures! Beautiful animals in motion! Wonderful captures. Hi Thomas, and thanks for your post. Wow… how great it must be to able to share the same field with such fine animals. Being able to do amazing photos is just a big plus (for us viewers as well). I’ll will be back for sure. fabulous photos and love the way you have captured the antelope. a big thumbs up!! The second and last ones are my favs: absolutely amazing captures! outstanding serie . so beautifull!! oh wow. i don’t know if i’ve ever seen that animal before. beautiful. must be a deer cousin? you hid the harsh lighting and everything gorgeously. those are superb shots. I am late in commenting on this…so many people wait for your photos!Well, these are great as ever.And I believe you must have had a great time doing this…These black bucks are magestic!And they seem to like you. By the way, I am back, thanks for your concern. La dernière est fantastique ! Bellísima serie. La gracilidad del movimiento y la impresionante luz de todas ellas las convierten en algo realmente bonito. Un gran trabajo. Saludos. les lois de la pesanteur en disparaissent! superbe! Wonderful and stunning wildlife photography. You are the best! I LOVE the very last shot most of all, grace embodied in that one, tremendous reflexes you have with the camera. Wow! You really made it look easy here. These are amazing images. I especially like #2 for the fantastic contrast against the background, and the ‘flyer’ at the bottom. Excellent! Excelllent timing with the jumping black buck. Great photo showing all the dynamics of this animal. I must join the most commented on blog, saying these photos are just perfection. love those curly wurly horns and the leaping buck. incredible and sharps shots, congrats…beatifull animal…. the last shot is just stunning!